Did you get a sheet of melamine to clamp across the back of the boat? 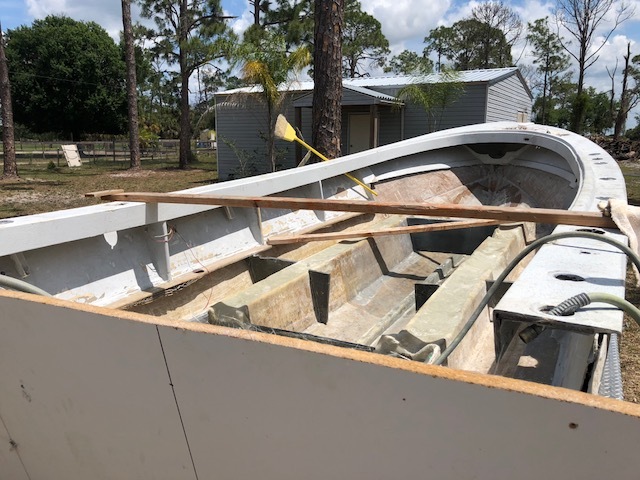 If you want to build up a notched transom to a full transom it is better to build up the skin not only on the notch but also the inside of the transom. It is easier to build against a flat piece of melamine to build it up and tie it into the inside instead of building up the outside after the fact. Looking at the transom skin I think it's toast and should be cut out. 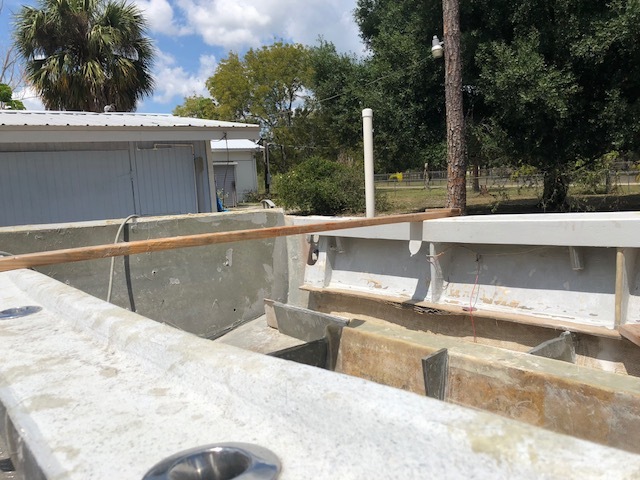 The easiest is to leave a 2" lip around where you cut out and then you attach the melamine to the 2" lip and get it flat to the back of the hull. You'll be happier with the outcome. 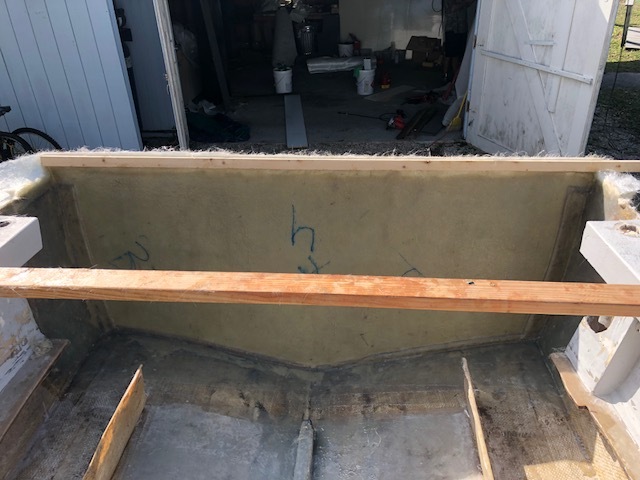 After you get 3 layers of staggered cloth on the inside of the transom and a pipe in the bottom at the drain hole, you'll have a good foundation to glue the transom material in. You can also search for dirtwheelsFL and see how he does it. I'm with Rick. Get some melamine and it will give you something on the outside to work against and will make a nice flat surface when you're done. Check out pages 4 and 5 of my build, I just did this a few months ago. Also, not sure what size bolts you plan on using. I went with a bunch of 1/4" ones and some of them twisted off when I tried to remove them. I used epoxy and it didn't want to let go! If anyone’s reading this thread now or 10 years from now here’s the link to the video on glassing up the outer skin and fastening the melamine sheet. Got the outer skin on the transom laid up this weekend. Took Marcel's tip from his video and used deck screws then ground them off from the inside once the melamine was fastened. There's 1 layer of 1708 and 3 layers of mat for the outer skin and I plan to do the same lamination on the front side once the Coosa gets set in. What I did forget to do was install the PVC drain to the bottom, just thought about it when I got on the computer. Also added 2 layers of mat in the front between the stringers and 3 layers in front of the transom, this really beefed the hull up especially with the center stringer!! Big thanks to Rick & Mike for the suggestions on ditching the old transom and starting fresh.. Boy what a hassle that would have been to reuse the old one. Looks good! Don't delay any longer to get that pipe in there, you're already moving the low point in the boat forward with each layer of glass. Looking nice. I'm not a fiberglass expert but I know a lot of people go with more 1708 and less mat. I don't know the strength difference but it may be something to double check before you get too much further. I just checked your lam schedule, and definitely think you need to add more structural glass, minimum of 3 layers 1708 inside and out. Mat builds up thickness weight and bulk but offers little in the way of strength. You can test this by laminating up 3 or 4 layers of mat. Hit it with a hammer, and the hammer just punches through. In other words it is doing nothing to spread a load. The transom main job is to spread the load of the motor and transmit it to the hull. It’s best to think of mat as either a cosmetic (sacrificial for fairing) or as a way to increase bond between materials (that’s why 1708 incorporates a layer of mat. x2 on Michael's recommendation. I also think you're going to have to cut your cap back so that you have at least 18" of working room (stringers too). Use 5 minute epoxy to secure the pipe in now too (12" long, 1" pipe is enough). To dry fit your cloth, lay a 1x2 across the hull sides a few inches above the transom and clamp it in place. 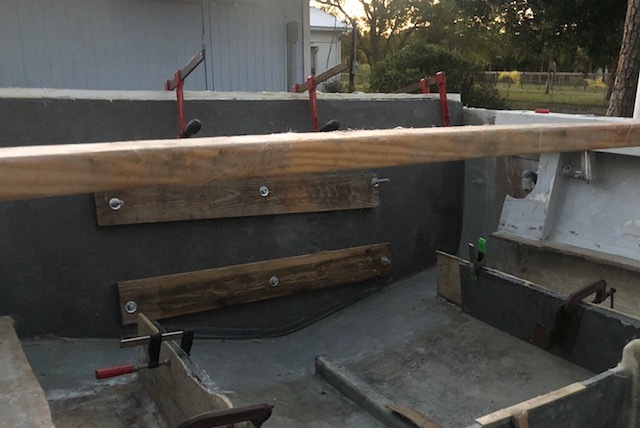 Cut enough cloth so it hangs over the 1x2 and down into the hull extending out onto the hull side and bottom by 4" - secure this first layer to the 1x2 with a few spring clamps. Dry fit this first layer of 1708, cutting the cloth so the first layer extends past the corners onto the hull side and bottom by 4". Cut "darts" out of the cloth so the cloth lays flat in the corners where the transom, hull side and hull bottom meet. Measure, cut and hang the next layer of cloth so the 2nd layer extends past the corner onto the hull side and bottom by 8". Clamp this layer to the 1x2 using the spring clamps. Measure, cut and hang the 3rd layer so it extends past the corner onto the hull side and bottom by 12". Clamp this layer to the 1x2 using the spring clamp. So at this point you have 3 layers all trimmed in with the necessary darts. I use a sharpie and mark where each layer ends, so I know how far to roll the resin out. Now grab the ends of the cloth and flip them over the 1x2 and out of the boat. BEFORE you start the laminating process you need to round out all the corners that the 1708 will traverse (or try to). You do that by mixing up some thickened resin (mix with chopped glass and cabosil) and when mixed, then add the hardener and use a wooden spoon or something rounded that you make (a good radius is that of a shot glass rim), and spread the thickened resin into the corners at hull side and hull bottom and drag the rounded object down the corner removing any excess so it becomes a rounded corner. You do this on the hull side and bottom. Let it start to harden - this helps the 1708 make the transition of the corner easier - 1708 doesn't like corners. These are called "fillets". While the fillets are starting to harden, mix up your resin, remember, enough to do all 3 layers of cloth (you can try using the 2oz of resin per sqft of cloth approach - your cloth is 6 ft wide by 3 ft high, that 18sf x 2 oz = 36 oz of resin x 3 layers = 108 oz of resin). After the fillets are almost hard pour the resin into a pan and start rolling the resin out where the first layer of cloth fits. Now flip the first layer of cloth into the boat and roll that into the resin with the soft roller and a hard roller. Don't put too much pressure on the fillets so you don't squeeze them out. Roll more resin onto the first layer and flip the 2nd layer into the boat. Work that in and flip the 3rd layer into the boat working that into the resin and top coat it with resin until its sufficiently wetted out. 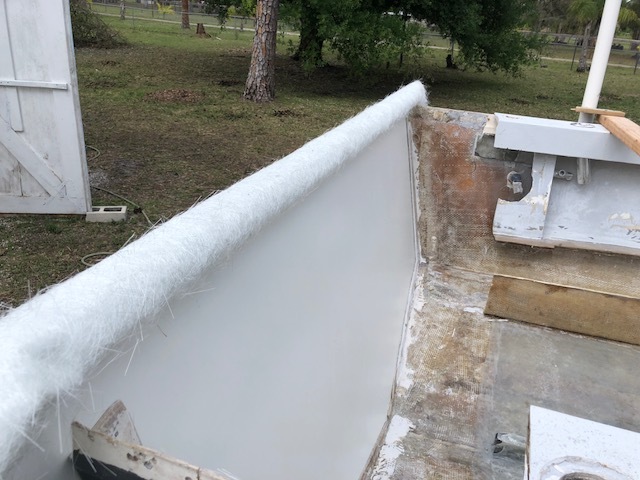 You don't want to use too much resin or it will pool at the bottom of the transom in the hull. You also don't want to have a dry lamination either. After the 3 lams harden, use a grinder with 80 grit pad and lightly scruff up the lamination and make sure it is all pretty smooth. Dry fit the core. When you're ready to set the core, mix up some more filleting material and do the corners again and then mix some thickened resin - enough to trowel onto the flat side of the transom and the side of the core that will lay against it. Then set and clamp the core in. When the core has set and it's time to laminate 3 more layers of cloth onto the inside, start with the dry fitting of the cloth (use the 4,8,12" overlap), flip it out of the boat and over the 1x2. Depending on how you clamped the core in you may have holes to fill with thickened resin. You will also need to fill the gaps around the edges of the core where it meets the hull sides and hull bottom and also need a new fillet around those new corners before you start laminating in the cloth. Laminate the 3 layers of cloth like you did before. Now you have a very stout transom that is a part of the hull because you tied it into the hull sides and bottom. Long time no post, turkey seasons wrapped up and it's boat time again. Took everyone's input and now have a total of 7 layers of 1708 with a few sheets of 1.5 oz mat mixed in for the outer skin of the transom. Figured going a little overboard can't hurt. It's all set in place with vinylester putty and is rock hard, I'll be tackling the inner skin this weekend. I set my dimensions for the bulkheads and have them temp'd on with the putty as well, may add a few more to the outer stringer area if theres left over coosa. Yes, I was moving quick and didn't set the PVC in the transom again, I plan to take a barrel sander to the area and get it back to existing height. Nice, I think you'll be glad you used the 1708.